Born in Baltimore, Maryland, Michele Wiles received her early training in Washington, D.C. At the age of ten, she received a full scholarship to the Kirov Academy of Ballet in Washington, D.C. where she studied from 1991 to 1997. Wiles also participated in the summer programs at The Joffrey Ballet and The Royal Ballet before joining American Ballet Theatre’s Studio Company (now ABT II) in 1997. In 1996, Wiles was a Gold Medal winner at the 18th International Ballet Competition in Varna, a Bronze Medal winner in Nagoya, Japan and a finalist at the Paris International Dance Competition. She was a Princess Grace Foundation — U.S.A. Dance Fellowship recipient for 1999-2000 and won the Erik Bruhn Prize in 2002. 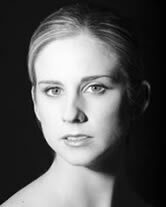 Wiles joined American Ballet Theatre in 1998 and was promoted to Soloist in 2000 and to Principal Dancer in 2005. Her roles with the Company include Polyhymnia in Apollo, Gamzatti and a Shade in La Bayadère, the Fairy Godmother and the Winter Fairy in Ben Stevenson’s Cinderella, Aurora in Coppélia, Medora and an Odalisque in Le Corsaire, Kitri, Queen of the Driads and a flower girl in Don Quixote, Hermia in The Dream, Myrta in Giselle, Grand Pas Classique, His Experiences in HereAfter, Lescaut’s Mistress in Manon, the Sugar Plum Fairy and the Snow Queen in Kevin McKenzie’s The Nutcracker, Hagar in Pillar of Fire, the Siren in Prodigal Son, Raymonda and Clemence in Raymonda, Princess Aurora and Lilac Fairy in The Sleeping Beauty, Odette-Odile, the pas de trois and the Polish Princess in Swan Lake, Ceres and the title role in Sylvia, the fourth movement in Symphony in C, the pas de six in The Taming of the Shrew, the Tchaikovsky Pas de Deux, and leading roles in Baker’s Dozen, Ballet Imperial, Ballo della Regina, Black Tuesday, The Brahms-Haydn Variations, Dark Elegies, Diversion of Angels, Drink To Me Only With Thine Eyes, Études, Glow – Stop, In The Upper Room, The Leaves Are Fading, Marimba, One of Three, Petite Mort, Sinfonietta, Symphonie Concertante, Theme and Variations and workwithinwork. She created leading roles in Concerto No. 1 for Piano and Orchestra, Dumbarton, Gong, One of Three and Within You Without You: A Tribute to George Harrison.